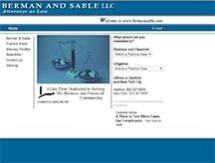 At the law firm of Berman & Sable LLC, we pride ourselves on our ability to provide the personalized service of a small firm while offering the resources of a large firm. If you would like to learn more about the benefits of choosing our law firm for your business's needs, you can take advantage of our free initial consultation. In addition, you can visit our website at www.bermansable.com.